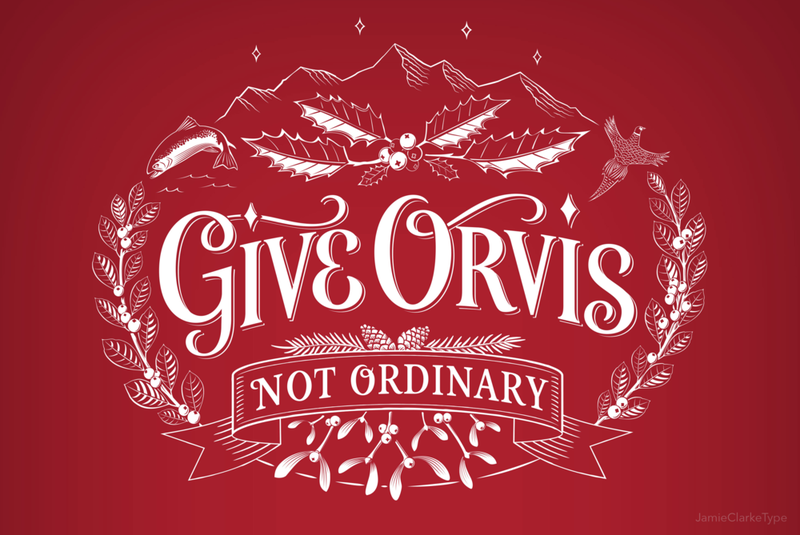 Orvis asked me to design a festive motif for its global holiday campaign with the central messaging: ‘Give Orvis Not Ordinary’. The design needed to reflect the premium quality of Orvis’s products and impart a seasonal feel. To encapsulate the company’s enthusiasm for nature and love of the wild, the decorative lettering is surrounded with winter plants and animals. The piece aims to capture the excitement and wonder of the great outdoors. The overall design was to feel inviting and well crafted but not appear retro or old fashioned. A simplified version was also produced for use on smaller spaces and on complex backgrounds. The artwork appeared in all types of media and had prominent placement in Orvis’s stores worldwide. Based in Vermont, Orvis have been making high-end fly fishing, hunting and outdoor goods for over 160 years and have a long record of conservation programs. Graphics at the Regent Street store in London.